That would be a cool band name! As a family, we are always saying/hearing/reading funny combos of words and we exclaim: “That would be a cool band name! !” It’s kind of a running joke in our family. Some of my favorites have been: Splatter Cat (I know, ew, right?) Taco Over-Load and Mental Mohawk. I hosted bunco last week, and I still have the box with all of the bunco gear (dice, pencils, etc.) In the box, for some strange reason, is this ring. What the what? And why is it in the bunco box? 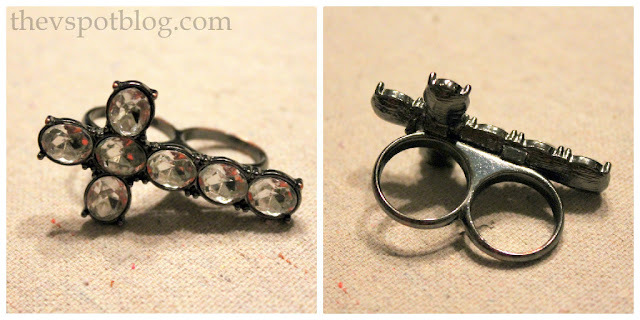 Handsome Hubby said it looked like brass knuckles for Christ… We all laughed and said, Yep! That would be a cool band name! By the way, we are giving away a ticket to the SoCal Social. If you’ll be in the Southern California area on October 20 and 21, you should come on over and give it a try! Brass knuckles for Christ – that it hysterical!! Okay, that’s funny! We always say “shh, someone might use that as a kids name.” Reminds me of the court case over Talula Does the Hula- an actual child’s name. Ha! That is funny!! Love the pic of your son. Cute! Your family is hilarious, and how in the heck did someone roll those dice all night with that gaudy thing on their hand? We don’t have band names, but we keep a running tally of horrible names. Mark has had some awful names of clients over the years. My father held the record though. Business associate unfortunately named “Athena Rottencrotch”. KID YOU NOT. The best part? She had changed her name from some very German sounding name to Athena because she thought it sounded more “American”. I also went to school with the mayor’s son, Mayor Gross that is.